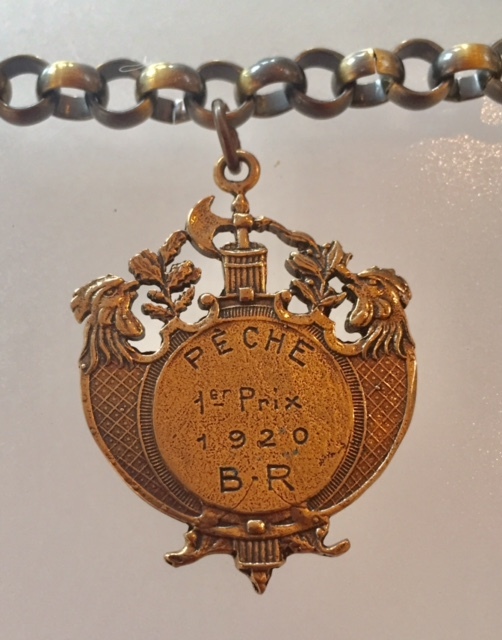 This is a french Fishing Award from 1920, the winner received first place (Prix) The verb "Pecher" means to fish or to sin, so I am assuming it was a fishing award... haha! 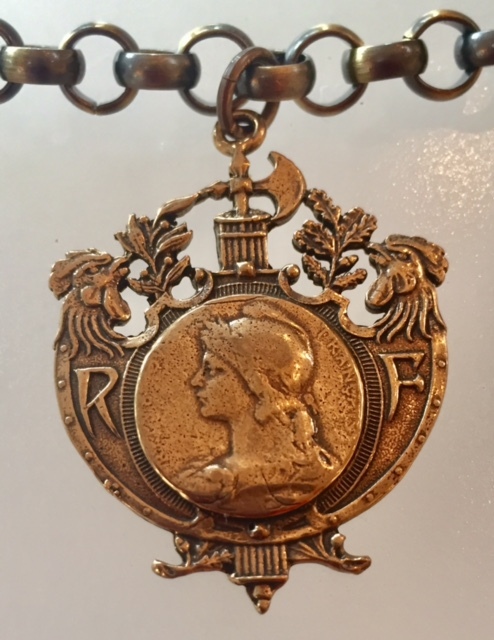 The front features Marianne, the French Symbol of Liberty, Fraternity and Justice (think Statue of Liberty) . It also has the Gallic rooster which (French: le coq gaulois) is an unofficial national symbol of France as a nation, as opposed to Marianne representing France as a State, and its values: the Republic. Featured here on a substantial rollo chain. Marianne is 1 1/8" W by 1.5" tall, chain is 22" long. Marianne is a national emblem of France and an allegory of Liberty and Reason. She represents the state and values of France, differently from another French cultural symbol, the "Coq Gaulois" ("Gallic rooster") which represents France as a nation and its history, land, culture, and variety of sport disciplines in their combative forms. Marianne is displayed in many places in France and holds a place of honour in town halls and law courts. She symbolises the "Triumph of the Republic", a bronze sculpture overlooking the Place de la Nation in Paris. Her profile stands out on the official seal of the country, is engraved on French euro coinsand appears on French postage stamps; it also was featured on the former franc currency. Marianne is one of the most prominent symbols of the French Republic. The origins of Marianne, depicted by artist Honoré Daumier, in 1848, as a mother nursing two children, Romulus and Remus, or by sculptor François Rude, during the July Monarchy, as an angry warrior voicing the Marseillaise on the Arc de Triomphe, are uncertain. In any case, she has become a symbol in France: considered as a personification of the Republic, she was often used on republican iconography — and heavily caricatured and reviled by those against the republic. Although both are common emblems of France, neither Marianne nor the rooster enjoys official status: the flag of France, as named and described in Article 2 of the French constitution, is the only official emblem.